Ethnic Art of Nomadic Tuareg on Chopping Block? Tuareg souvenir vendor at Mafo Lake in the Libyann Sahara. Author David Stanley, Nanaimo, Canada. A popular type of ethnographic art may soon be subject to a US embargo, if Libya has its way. A Libyan-Request to halt imports of tribal Tuareg art is a further expansion of the already very broad restrictions on importation of global art into the US. Tribal and ethnographic art professional and collector group ATADA has submitted a highly critical-response to Libya’s demand for US import restrictions to be imposed on ethnographic art up to 1911 from the Tuareg and Berber people of Libya. Libya claims that import restrictions are justified because there is “evidence for the looting of… sites with Berber ethnological material.” The Cultural Property Advisory Committee will review the Libyan request on July 19-20. The meeting is closed to the public – only seven days were allowed for public written comment and only one hour is allowed for members of the public to make five-minute presentations to the Committee. The Libyan request is extremely broad, covering the entire history of the geographic region and extending from the Paleolithic through the Ottoman Era (12,000 B.C.-1750 A.D.) as well as including ethnological material dating from 1551 to 1911 A.D. It covers everything from prehistoric lithic tools to Classical antiquities of the Roman period to Islamic furniture, brassware and calligraphy to nomadic herdsmen’s baskets and cooking pots – and everything in between. The request is generic and expansive, rather than specific, ignoring the requirements of the Cultural Property Implementation Act (CPIA). 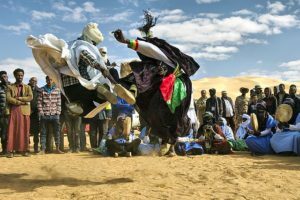 Al-Barket Tuareg Band performing a Tuareg tradition dance in the city of Ghat in Libya during the 22th Ghat Tuareg Festival. Author Bashar Shglila. The ethnographic materials include all Tuareg items of material culture up to the year 1911, made from stone, metal, ceramic and clay, wood, bone and ivory, glass, textile, basketry and rope, leather and parchment, and written materials. This does not comport with the the requirements stated in US law. The CPIA requires than import restrictions on ethnographic art apply only to items “important to the cultural heritage of a people because of its distinctive characteristics, comparative rarity, or its contribution to the knowledge of the origins, development, or history of that people.” Ethnological material also applies only to the art of non-industrial societies. For centuries, the Tuareg have been the great caravan drivers and traders of the Sahara. Tuareg craftsmen such as blacksmiths, leatherworkers, and jewelry-makers, who rank in the lower Tuareg social strata, made and traded Tuareg goods to other Tuareg and to their Hausa, Falani (Wadabe) and other Saharan neighbors as a business. The Tuareg are traditionally a nomadic people, and their possessions, while often beautifully ornamented, are functional household items carried from place to place. They suffer hard wear during the nomadic life. Therefore, it is extremely unlikely that any traditional goods could be found inside Libya dating before 1911. Because Tuareg goods are very similar over time, there is nothing that would enable US Customs to distinguish between post-1911 lawful and pre-1911 unlawful items to import. Libya also has one of the smallest Tuareg populations among the eight African and North African states where some 2-3 million Tuareg people live. There are only 15-20,000 Tuareg in Libya, according to most estimates. The vast majority of Tuareg live in Niger and Mali, and as make items very similar to or even indistinguishable from other Tuareg populations. Therefore, US Customs would be unable to differentiate between, for example, lawful Malian or Niger Tuareg and unlawful Libyan Tuareg items. Most Tuareg items could not even be identified by specialists as coming from the geographic region of Libya – or not. Libya is very unlikely to be the source of any Tuareg material entering the US. For example, there are 2903 items identified as Tuareg in the Musee du Quai Branly in Paris, one of the world’s largest and most comprehensive collections of Tuareg art and handicrafts. Only four of the items are identified as from Libya: a tambourine, a talisman, and two photographs. The Department of State thus asserts on its own behalf that (1) the Libyan government does not consider the Tuareg to be Libyan and is attempting to expel them, but at the same time sets forth the Libyan proposal that (2) the U.S. government should return any objects created by the Tuareg to the Libyan government as essential to Libyan heritage. In its complete statement, ATADA argues that not a single criteria set by Congress is met in Libya’s request as a whole, whether in the case of Classical antiquities, which the Libyan government has said were not at risk of looting or destruction only a few months ago, in the ethnographic materials of the Tuareg, or in the artifacts remaining from Libya’s Jewish community, which was some 40,000 people in the early 20th century, but not a single Jew remains today.